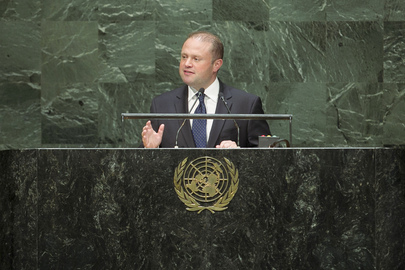 JOSEPH MUSCAT, Prime Minister of Malta, highlighted the need for the resumption of meaningful negotiations in the Middle East. “Too many innocent civilians have died; too many children have been buried,” he said. Statesmanship was needed from the politicians on both sides to resolve the conflict. Negotiators must be willing to make the right choices, not the most convenient ones. They might not be the most popular, but they would be the most enduring. Concerning Syria, he urged the Security Council to assume its Charter-based responsibilities and act urgently and decisively to end the bloodshed. Regarding Libya, the United Nations must provide capacity-building and security to bring stability and prosperity to the Libyan people. Disarmament and national reconciliation were prerequisite to the country’s advancement, he added. Moving on to the spread of extremism and intolerance, he said the world was witnessing the “globalization of hatred”. Extremists were increasingly interconnected through networks and inventions whose main aim should be progress and education. Disenchanted youth were radicalized into movements that knew no limits. He stressed that nobody was immune to what was undoubtedly the biggest threat to world stability and peace. He also called for more attention to the plight of illegal immigrants in the Mediterranean. Both Malta and Italy were doing their utmost to save lives, but the States receiving waves of migrants could not stand up to the challenge alone. He therefore urged the international community to help them stop the great human tragedies that came with the risky crossing of the Mediterranean. Closer cooperation between countries of origin, transit and destination was needed, as were better enforcement mechanisms and stronger penalties to stop and punish human traffickers. Better implementation of internationally agreed upon commitments was also crucial, he added.